Last week was a busy week for me, including a road trip with coworkers to Philadelphia in the midst of unseasonably snowy weather to attend this year’s Public Library Association conference. It was a fabulous experience, including interesting continuing education sessions, excellent speakers, and the chance to browse a wonderland of booths set up by publishers and library related vendors. 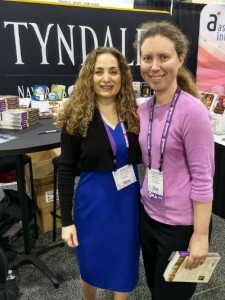 I picked up a half dozen advance reader copies of titles from some of my favorite authors and publishers, but the most pleasant surprise of the trip was discovering that author Tessa Afshar would be signing books at the Tyndale House booth! Of course, I had to meet her and tell her how much I love her books. Including this one, that I’d previously read, but had not yet posted my review. Length: 9 hours, 30 minutes. Unabridged. One of the things I love about reading well written Biblical fiction is the cultural perspective and context it can give on its time period and surroundings. This novel does that for the early church in Philippi. I loved witnessing the purple dyeing process in vivid detail, and learning relevant bits and pieces about taxes, citizenship, law, and doing business in the Roman Empire. Some fascinating stuff in the context of a compelling story. The book features Lydia as a strong and principled female character, fighting for success in a male dominated world. Great start already, right? I will forewarn you, there is some preaching in this book. But I think that’s to be expected in a story based around Acts 16, which features a visit by the Apostle Paul. And, quite frankly, I found it refreshing to find a clear presentation of the gospel in a work of Christian fiction. So often, I think authors are afraid of being deemed “preachy” and shy away too much from addressing important topics. Not so here, and I think the story is all the better for it. This story’s not a romance, per se, but I did appreciate the romantic bits thrown in. Sort of the icing on the cake. I also enjoyed a cameo appearance by characters from the author’s earlier book, Land of Silence, another lovely read worth checking out if you haven’t already. Overall, Bread of Angels is a fascinating historical tale, built around a Biblical framework, that I feel is well worth reading. The narrator of this audiobook, Rendah Heywood, employs a very pleasant reading voice, with a mild accent that works quite well with this story. Given that the story is primarily told from Lydia’s viewpoint, there’s not a whole lot of distinction required between character voices, and yet, the narrator does distinguish clearly enough that there’s never any confusion regarding who’s who. I am quite happy to have selected the audio edition, and would recommend it to others. I borrowed this audiobook from my local library. I was not expected to write a review, but wanted to share how much I enjoyed the book. And I have since received a signed copy of the print edition from the publisher and author, much to my delight.